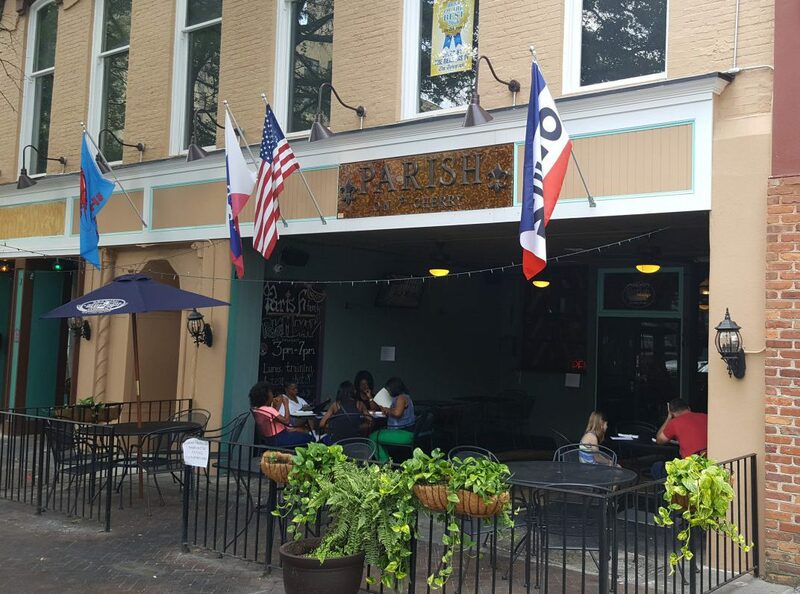 Parish on Cherry Street is a New Orleans themed restaurant that serves sandwiches, sea food, brunch, as well as Cajun and Southern favorites. Photo by Doug Deal. After the close of Lemongrass, my family and I have been looking for a new place to get an occasional Saturday brunch. By accident, we stumbled across Parish’s brunch menu. It has been open a year and since we have been meaning to try it, we gave it a shot. We are extremely happy that we did. The restaurant is at 580 Cherry St. in a renovated building near Macon’s Cox Capitol Theater, close to the corner of Second St. At first glance you immediately get the impression of a New Orleans bistro. 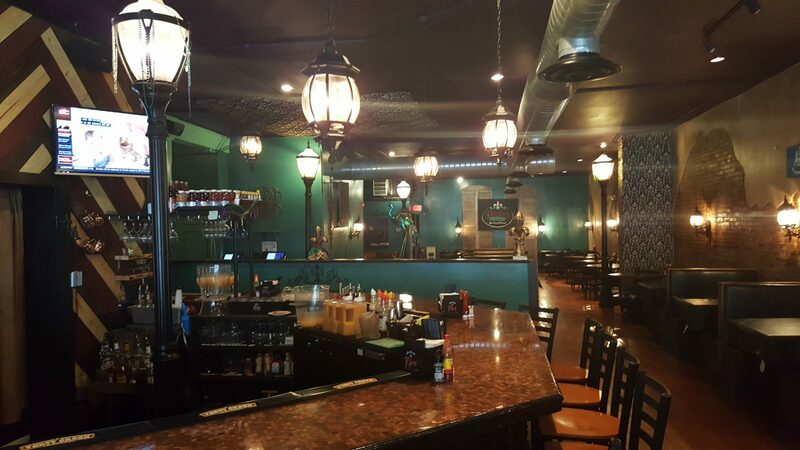 The interior is stunningly decorated in a way that transports you to the Big Easy and whets your appetite for some Cajun favorites. Light is provided from some gas light replica lamps that truly add to a street side cafe appeal. Parish has an inviting interior decor that is dominated by a gas light motif. The restaurant includes a bar at the front. Photo by Doug Deal. The service was attentive and the pace was a good compromise between relaxed and urgent. Wait staff were eager to fill a glass and serve your needs without interrupting conversation or making the meal about them. This is something I really appreciate, because a meal out is meant to be spent with your companions. Parish fulfilled our needs without taking us out of the flow of our conversation. I ordered the bottomless mimosa. 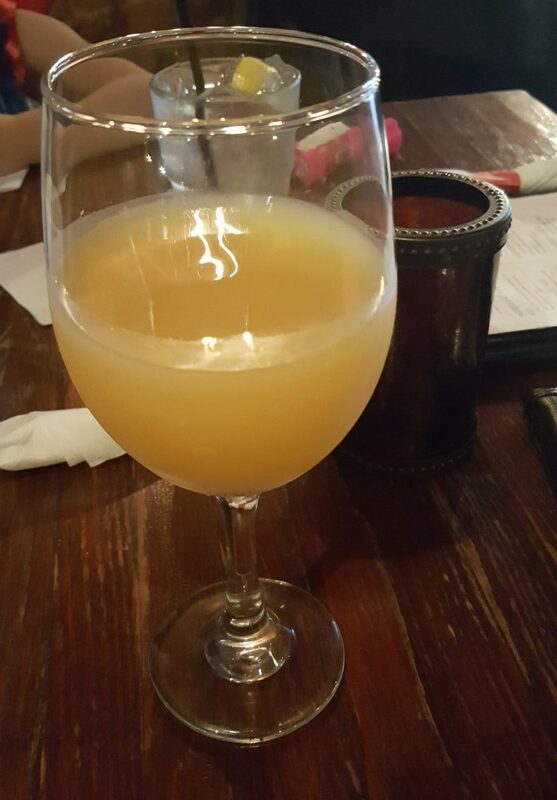 I am not much of a drinker, but a mimosa is obligatory at brunch. I do not know the ration of orange juice and champagne, but it was much to my liking. Not overpowering, but you can definitely taste the alcohol and was a refreshing beverage for a first meal. The eggs Benedict had a New Orleans accent and was served with thin sliced ham a bit of spinach and a creamy hollandaise sauce on a bed of a lightly toasted English muffin. Photo by Doug Deal. My entree was the eggs Benedict, another obligatory brunch item. The version I chose was the more standard option, with ham, hollandaise sauce, egg on a toasted English muffin. The Parish touch is to add a bit of spinach, which is something I have never had before and it is a nice change. The egg was more well done that I would make at home, but I am aware of the tastes of most restaurant patrons and it would be appreciated by most people as the yolk was a soft ball and not running over the dish. I prefer the latter, but I was not disappointed. Parish’s “Southern Delight” is 2 deep fried grit patties, blackened chicken, tomatoes and green onion and topped with a remoulade sauce. Photo by Doug Deal. For those who are a little more adventurous, they have a crab cake eggs Benedict option that I might try the next time, if I am not tempted away by the biscuits and gravy. There is something about the comfort of a biscuits and gravy that bring back Saturday breakfasts with family in my youth. 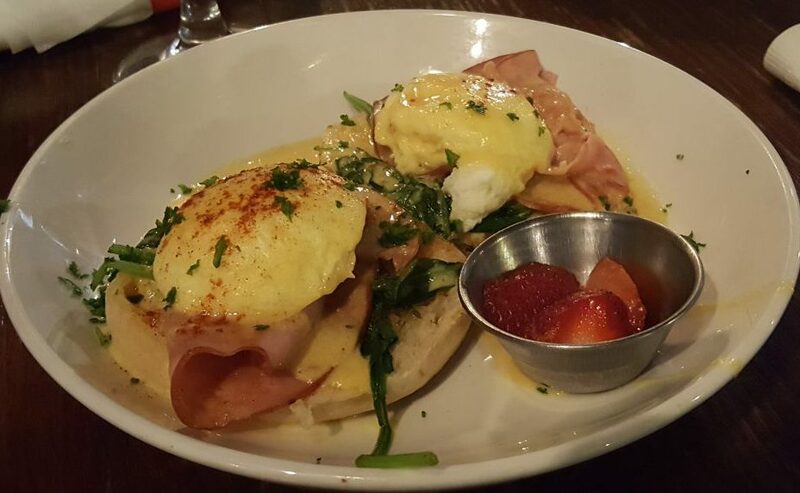 Like most dishes, the eggs Benedict was served with a side of deliciously smokey and sweet bacon. It also came with sliced strawberries and all of it combined for an enjoyable experience. I commented on the drive home how relaxed I felt after the meal, which to me is the ultimate goal after a good brunch. For bacon fans, they also offer a candied bacon that was hard to resist ordering, but I am certain will be something I will try in the near future. One of the options at brunch is the bottomless Mimosa at $12. Perfectly balanced between orange juice and champagne. Photo by Doug Deal. My wife ordered the Southern Delight, which is a signature dish. 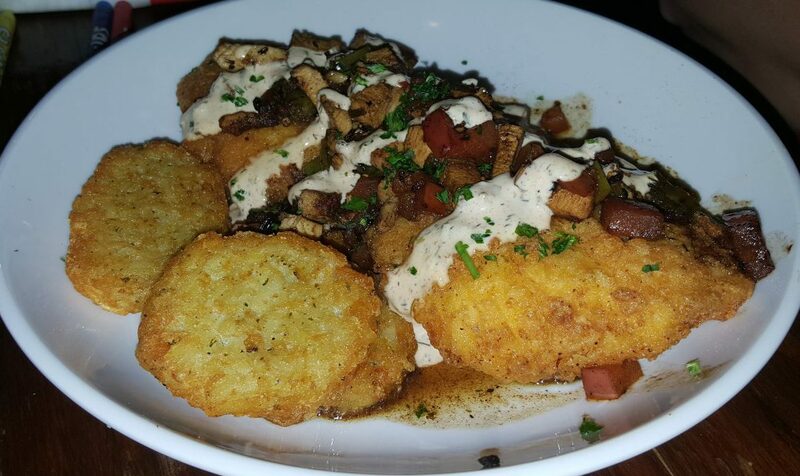 It combines their deep fried grit patties with blackened chicken and sauteed savory vegetables. It also came with three potato cakes as a side. I am not a grits eater, but I did like the patties and the potato cakes were exactly what you would expect. This is not a dish I would order, but my wife loved it. My son ordered the French toast. The toast was thick cut with a nice crispy outside dusted with powdered sugar. It was served with bacon and strawberries as well as syrup. My son ate every bite before I had a chance to ask for a taste, something I regret immensely. It looked delicious. 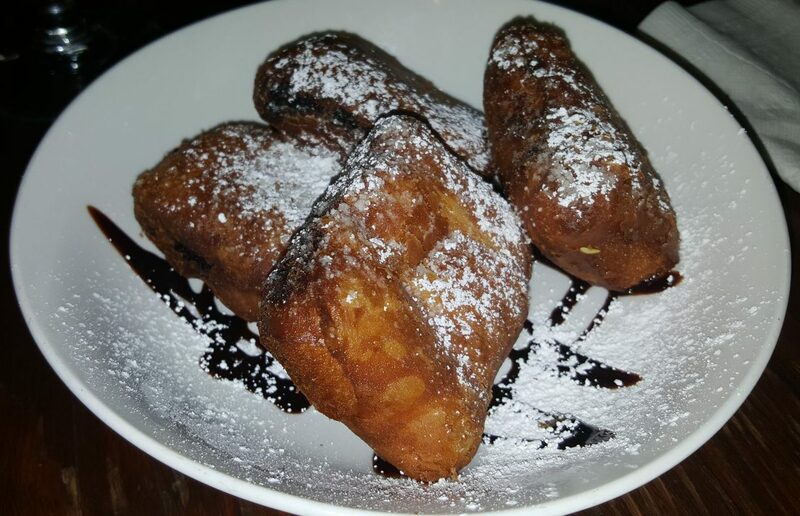 Parish’s chocolate filled beignets are a light pastry filled with chocolate. Not so much a doughnut, more similar to a croissant. Photo by Doug Deal. My daughter ordered the chocolate stuffed beignets, which are a New Orleans treat. They are very reminiscent of the chocolate filled croissants I had in France. We were uncertain if the beignets would be to her liking, so we also ordered her grits and bacon. She loves bacon, but she loved the beignets so much, it was left untouched and the only thing left of the beignets was a circle of chocolate around her mouth. Truly a winner from her perspective. 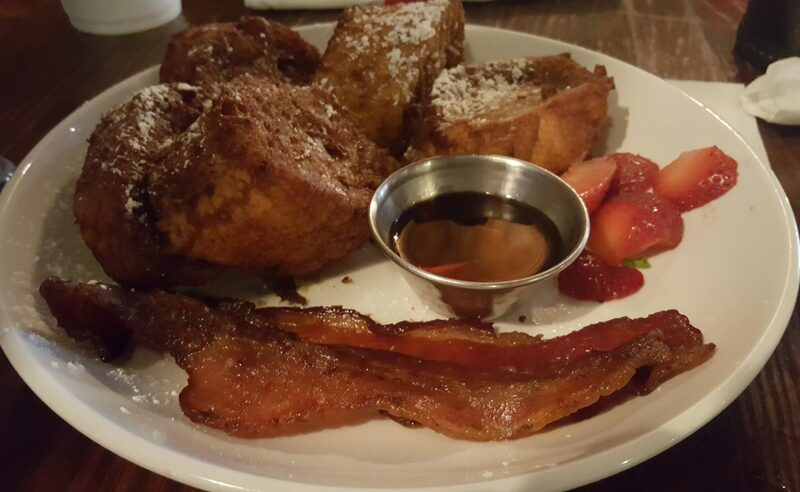 Thick cut French toast with a side of smokey bacon and cut strawberries. Exterior is lightly crispy and the middle moist and creamy. Photo by Doug Deal. Before we left, the manager on duty stopped by and spoke to us and inquired about our meal. You can tell they care about their diners experience, and he told us that Parish will be opening up on Hartley Bridge Rd. soon. They have also acquired another downtown location for another restaurant concept. If you want a truly enjoyable brunch, give Parish a try. Brunch is served Saturday and Sunday starting at 11AM. The restaurant also serves off of their regular menu that has a long list of favorites. Parish is open 7 days a week at 11AM and closes 10PM every day except Friday and Saturday when it closes at 11PM.